Having defended the UFC lightweight title with a fourth-round submission of Conor McGregor, Khabib Nurmagomedov is now back in his native Dagestan — and what a welcome he received in his homeland. Shortly after arriving in the capital of Makhachkala, Nurmagomedov spoke to a stadium full of thousands of frenzied fans, all eager to share in his victory with him. Unsurprisingly, one of the topics to come up was the post-fight brawl between Nurmagomedov and McGregor’s teams, which ignited when Nurmagomedov leapt over the cage and attacked McGregor’s teammate Dillon Danis. “I prayed to God for one thing, to be left alone in the cage with this clown [McGregor],” Khabib Nurmagomedov said (via Denis Geyko of RT). “I asked him this every day. I prayed that we would have no injuries, that we would make weight, and regain our strength, and finally be locked in that cage. Because a lot was said outside that cage, and I said that once that octagon door is shut, I am not responsible for my actions. “The first thing I wanted to show him, is the difference between our people, and his people,” Nurmagomedov added. “We know our history, our ancestors, and what our people have been through. Nothing can break us. While Khabib Nurmagomedov is standing by his actions in the fallout of his fight with Conor McGregor, he is currently facing disciplinary action from the Nevada State Athletic Commission, who oversaw the fight. While nothing is certain yet, it’s more than likely that he’ll be hit with both a fine and a suspension. 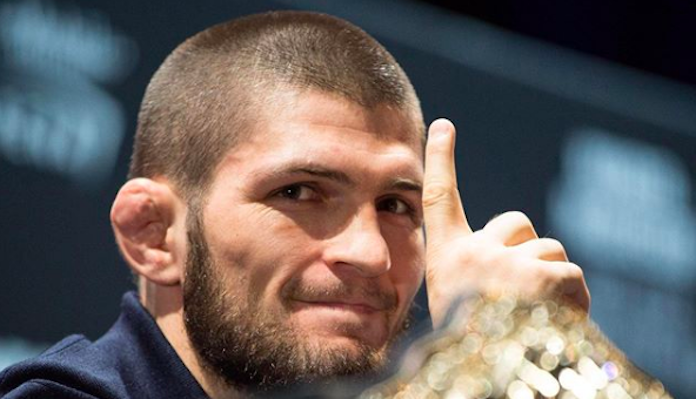 What do you think of these comments from Khabib Nurmagomedov?